many are denied the opportunity! Tempers flared. Their voices interrupted each other at an all-time high. Angrily they each tried to win the other over to their point of view. In frustration, the younger man stopped dribbling the ball and slammed it in the general direction of the hoop. It missed. “I’m out of here,” he exclaimed. “We can’t agree! What’s more, I’m beginning to think we have nothing in common; not even basketball!” He bent to scoop up his jacket that had been flung to the ground during the heat of competition. The older man bit back a biting retort. How quickly the minor disagreement had escalated into an all-out battle. Testosterone, adrenalin, low levels of emotional intelligence, and a few self-esteem issues thrown in for good measure. “We do have one thing in common,” he offered. “We’re both growing older, even as we waste time and energy arguing.” He smiled thinly, trying to change the flavor of the conversation. The younger of the two paused in his retreat. “It can’t happen too soon for me,” he growled. His face still resembled a thundercloud. “In some ways, it’s happening too fast for me,” his elder countered. Fortunately, his face-saving suggestion appealed to the younger fellow. With a rueful grin, he took off at a run to retrieve the ball. They were both right—human beings do get older (if they are fortunate enough to do so) and many differ in the way they not only approach but also perceive that phenomenon. The 2nd Greek philosopher, Epictetus, believed it’s not what happens to you that matters as much as what you think about what happens to you. While you may not have much choice about aging chronological; you do have a choice about the way in which you approach it and even at the rate you age, at least to some degree. You can view growing older as a death sentence and whine and blame and complaint (which your brain must get tired of quickly to say nothing of those around you) or as yet another adventure. Perhaps the ultimate adventure. The latter can help you to positively embrace the inevitable and move on gracefully with the process. Many of the characteristics associated with growing older are not absolute prescriptions. Rather they are related to your generational inheritance (some chromosomes and genes and some transmitted behaviors), the way in which you have lived your life so far (the choices you have made), your level of emotional intelligence or EQ, your mindset and self-talk patterns (positive or negative), and your level of knowledge about the process. Studies suggest that some of the so-called symptoms of aging are preventable. Senility, for example, is not part of the healthy aging process. Still other symptoms can be delayed when you make a conscience effort to develop a high-level-wellness lifestyle—or a Longevity Lifestyle as I now call it. Studies have shown several strategies that can be effective in retarding the onset of aging symptoms and, in some cases, in even reversing mental and physical decline. What are they? Here are two habits that don’t cost the proverbial arm and a leg! One: The first strategy is thirty (30) minutes of challenging mental exercise every day. The soaps on TV and romance novels don’t qualify. The neurons (thinking cells) are not muscles in the sense of muscle tissue but they respond in much the same way. With exercise they grow stronger; without it, they atrophy. And what can regular mental stimulation do for your brain? It’s the old “use it or lose it” admonition. The drawing on the right portrays a heathy neuron with its cell body, axon, and dendrites. Although not muscles, neurons respond much like muscle cells; they tend to atrophy with disuse and become stronger with exercise. Use it or lose it is the mantra for brain-function in the 21st century! 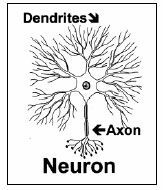 Look at the neuron drawings below: each as has a cell body, a long axon projecting from the cell body, and finger-like projections known as dendrites—which help pull information into the neurons so you can “think” about it. The more dendrites on a neuron the more connections it can make with other neurons. Learning new information or doing something in a new way can give your dendrites a workout. 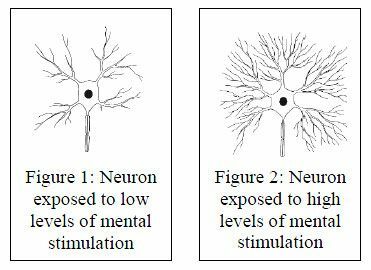 You can alter the shape of a dendrite in thirty (30) seconds and grow a new one in thirty (30) minutes depending on what you are doing and how cognitively challenging and stimulating the activity is to your brain. And it’s likely possible to grow 10,000 dendrites on each neuron. How do you want your neurons to look? Volunteer in the way that works for your brain and change your life, and that of someone else, in the process. . .
As soon as you have developed competency in one activity, begin working on a new one. The key is variety. The brain loves it—at any age! Just imagine how your neurons will grow additional connectors (dendrites) and stretch out to nearly touch their neighbors. Two: The second strategy is thirty minutes of aerobic exercise every day. Walking, biking, swimming, running, racquetball, music aerobics, muscle building gym training—all can all qualify. Even individuals who are in wheelchairs and/or are bedridden can often alternately contract and relax the large muscle groups of the body. Regular physical exercise acts as an antioxidant by sweeping out free radicals. It stimulates the immune system, strengthens the circulation, and helps to improve the flow of oxygen and nutrients to the brain. Some of the deterioration in thinking ability often associated with aging really has more to do with one’s state of physical health. The mind and body run hand in glove; strengthen one and the positive effects often rub off on the other. In order to accomplish this, however, you must take responsibility for building these strategies into your daily schedule. It doesn’t happen just by wishing. At least it hasn’t happened for me that way. Wonderful things can happen as you get older. At a recent Myths of Aging seminar I asked participants to list a few benefits. In no time at all there were more than two dozen on the flip chart. Here are some of them. Write your own list. Get to really know yourself and maximize your uniqueness. Learn to take fewer things personally and mellow out a bit. Embrace recovery strategies that help you to heal past injuries and woundedness. Manage stress and emotions and feelings more effectively. Emphasize interdependence rather than either dependence or independence. Learn how to receive as well as give—graciously. Nurture a healthy sense of self-worth in yourself and in others. Role-model high-level-wellness living, including a positive mind-set. One thing is for certain, the character traits and habits you develop now will likely be with you when you are older—and magnified at that. You can grow older with grace, dignity, and even enjoyment! Live every day as if it might be your last, while planning as if you will live forever. Implementing a Longevity Lifestyle is believed able to help you live younger for longer. Study the components of a Longevity Lifestyle. Check of the ones you already do—and keep doing them—and one by one build habit patterns around the others. A PAC mindset. 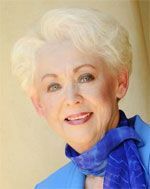 A Positive, Active, and Creative mindset provides the foundation and direction for your Longevity Lifestyle. Maximize a “growth” and “can-do” attitude. If you have an enemy outpost of negativity inside your brain, get rid of it. Dump worry and anxiety. They can trigger the stress response and flood your brain and body with stress chemical. Positive self-talk style. Take responsibility for your self-talk. Tell your brain what you are doing as if it’s a done deal and stop talking about what you don’t want to have happen. Avoid using words such as don’t and can’t and shouldn’t. Remember that you tend to communicate with others in the way you talk to yourself. Optimum sleep. Obtain the optimum sleep your brain needs. Take a 15-minute nap during the day if you missed sleep the night before. Sleep deprivation can drain your energy, accelerating aging, suppress both brain and immune system functions, trigger weight gain, and shorten your potential longevity. Sleep in as dark a room as possible to avoid interfering with melatonin production. Appropriate hydration. Dehydration is deadly. It can increase the production of free radicals, which can wrinkle your internal organs as well as your skin. Learn to differentiate between genuine physiological hunger and thirst. Unless medically contraindicated, drink enough pure water to have one or two pale urines per day. Drink a glass of water 15-30 minutes before you eat. Physical activity. Move it or lose it. Minimize sitting and maximize physical activity. Aim to exercise for thirty minutes each a day, in sections of ten or fifteen minutes at a time, if you prefer. Physical activity and exercise help tone your body and promote balance (homeostasis). Include a combination of stretching, aerobic, balance, and flexibility exercises. Variety is key to keep your brain interested and motivated. Select activities you enjoy and have fun doing them by yourself or with others. Brain stimulation. Engage in stimulating, mental activities for at least 30 minutes a day to keep your brain active—a gift to yourself and everyone who knows you. Include a variety of brain aerobic exercises to keep your mind interested and alert. Read aloud for 10 minutes every day—to yourself, your pet, or others. Minimize passive mental activities such as zoning out in front of the TV. Maximize active mental picturing: Read; Listen to books on tape; Play mental and word games; Travel (locally or abroad) to expose your brain to new sights, sounds, smells, tastes, people, and environments; Include music in your life and favorite hobbies; Hone your creativity in any way that works for you. A healthy body without a healthy brain is less than half the picture. Brain protection. Avoid brain trauma in every way possible (e.g., avoid pugilistic sports, arrange your environment to prevent falls, wear a helmet when bike-riding and for other sports activities such as skiing and skate-boarding). If you smoke, stop; if you don’t smoke, never start; and do what you can to avoid inhaling side-smoke. Avoid excessive radiation, toxins and poisons, vehicle exhaust, air pollution, and infections insofar as it is possible to do so. Protect your brain mentally, too. Be careful what you put into it. You only have one brain and neurons do not multiple and divide and replace themselves as do most other body cells. Take care of them! Exposure to light. Obtain moderate exposure to natural light. Flood your home with sunlight but minimize direct exposure to bright sun. Avoid sunburn, tanning parlors, and ultraviolet light as they can increase the risk for skin cancer and are believed to suppress immune system function. When in bright sunlight, consider wearing dark glasses consistently to lower the risk of macular degeneration. Healthy nutrition. Emphasize a Mediterranean cuisine. Read labels carefully. Lean toward plant-based unrefined and unprocessed foods. Eat when you are physiologically hungry. Minimize empty calories and maximize nutritious calories. Minimize chew-less foods and maximize chewy ones. Minimize snacking and maximize regular mealtimes. Rotate bites of food types to keep up taste-bud flavor intensity. When you choose to eat dessert, take only two or three bites. After that you’re eating largely from memory. Avoid the calories! Laughter and play. Be serious about life but avoid taking every little thing too seriously. Life is relatively short—a potential 122 years against eons. Make your life count and have fun in the process. Schedule regular opportunities for play, relaxation, fun, and variety. As the old saying goes: a change is as good as a rest. Hone your sense of humor. Figure out what tickles your funny bone and make time for it. Laugh mirthfully a minimum of 30 times per day. Very happy people reportedly laugh between 100 and 400 times a day—and they tend to be healthier and often very long lived. Support network. Select your close friends carefully. Who you hang out with matters! According to Jim Rohn, “You are the average of the five people you spend the most time with.” Studies estimate that within three years you are at risk for picking up the habits of those with whom you spend the most time, especially for happiness, smoking, health, and obesity. Choose friends who are smart, affirming, upbeat, reciprocal, and on a Longevity Lifestyle journey. Reinforce each other’s efforts and increase your likelihood of success. Be brave enough to let go of those who are abusive or who drag you down. Be the person you would want for your best friend. Stress management. Manage stressors effectively. Unmanaged stress pours out stress hormones, including cortisol and adrenalin, which can kill brain cells (contributing to dementia), accelerate aging, suppress immune system and brain functions, and trigger eating outside of nutritional balance. Engage in family-of-origin work to identify common patterns and habits that may be impacting your behaviors now. Live the 20:80 Rule: Only 20 percent of the negative impact to your brain and body is due to the event or situation itself; 80 percent is due to your perception of the event and the weight you give to it. High EQ. Raise your level of Emotional Intelligence quotient or EQ. Estimates are that IQ contributes only 20 percent to your overall success in life, while EQ contributes at least 80 percent. Do the math! Learn to identify core emotions quickly and accurately and to manage them effectively. Becomes skilled at recognizing the information they bring from your subconscious to your conscious mind. Feelings follow thoughts. If you don’t like the way you feel, change the way you think. Consciously choose the feelings you want to maintain over time. Minimize emotional eating as a crutch to feel better. Avoid denial about addictive-like behaviors. Remember that the biggest “cure” for one addictive behavior is another addictive behavior. Get help to create new, healthier habit patterns, as needed. Dump JOT behaviors that align with low levels of EQ: Jumping to conclusions, Overreacting, and Taking things personally. High life satisfaction. Craft your own personal life vision. Hone your spirituality—the spirit with which you live life. Do something every day to evoke a sense of awe in your brain and your spirit. Live in a state of gratitude. Being grateful has been shown to help delay gratification. Assist others, volunteer, and give back to the community. Consider doing random acts of kindness on a regular basis. Interact with selected individuals who possess a healthy superego, positive mindset and self-talk patterns, have a good sense of humor and laugh a lot, are smart and supportive, take good care of both brain and body, and have embraced a Longevity Lifestyle. Leave a legacy—do something to make your corner of the world a better place than when you arrived on this planet.